Is ancient wheat healthier than modern wheat? In some respects, it may be. Originally posted March 21, 2013; updated in 2017 to include information about more recent health studies. Is ancient wheat healthier than modern wheat? In some respects, it may be, according to three recent Italian studies that looked at inﬂammation, cardiovascular disease, and type 2 diabetes. In 2013, scientists at Careggi University Hospital in Florence decided to see if health markers changed when people switched between eating modern wheat and KAMUT® brand khorasan wheat. To do this, they conducted a randomized crossover study including three eight-week periods: one in which subjects with no prior clinical signs of cardiovascular disease ate their normal diet but with all grain products – bread, crackers, pasta and cookies – made with KAMUT® wheat, a washout period of eight weeks, and eight weeks in which all grain products were made with modern durum wheat and soft wheat. The results? Following the KAMUT® wheat phase of the study, subjects’ total cholesterol decreased on average 4.0%, their LDL (“bad”) cholesterol decreased 7.8%, and certain markers of inﬂammation dropped 23 to 36%. At the same time, blood levels of potassium and magnesium – two key minerals many of us are lacking – rose 4.6% and 2.3% respectively. Following the modern wheat control phase, total cholesterol dropped 2.1% and LDL dropped 2.8%, while potassium and magnesium actually decreased slightly; the three inﬂammatory markers were mixed with one almost neutral, another dropping 14% and one increasing 15%. These compelling results led the same group of researchers to use this study design in subsequent trials. In 2015, they looked at the eﬀects of the same replacement diet on subjects with Acute Coronary Syndrome, a type of cardiovascular disease (CVD). And in 2016, they studied the eﬀect of the replacement diet on the risk proﬁle of subjects with type 2 diabetes. The KAMUT® wheat phase of the 2015 CVD trial showed similar decreases in total cholesterol (6.8%) and LDL cholesterol (8.1%), and showed blood levels of potassium and magnesium both rising 2.3%. After the modern wheat control phase, the subjects’ total cholesterol and LDL cholesterol actually rose 3.0% and 1.7% respectively, and both potassium and magnesium levels fell slightly. Lab analysis of the KAMUT® wheat and control wheat showed that the two products looked fairly similar on paper with similar ﬁber levels and similar resistant starch levels (though with more potassium and magnesium in the KAMUT® wheat). And yet the health impacts were diﬀerent, leading the researchers to conclude that, “Dietary ﬁbre and resistant starch alone were clearly not instrumental in improving these metabolic parameters.” It’s what we’ve been saying all along here at the WGC: ﬁber and resistant starch are both great, but whole grain’s health beneﬁts derive from a lot more than simply ﬁber. It’s also very important to note that wheat — like all grains and in fact all whole foods — is a growing, living thing. The same variety of wheat grown in two diﬀerent locations, or in two diﬀerent years, may have diﬀerent levels of nutrients and diﬀerent impacts on health — before we even begin comparing varieties. Think about it: although you can look up “apple” in a nutrient database and learn how much vitamin C or ﬁber is in “an apple” the values listed will not be the same for all varieties of apples, grown in all weather conditions, in all years. This is one factor that makes nutrition research so challenging. Beyond these caveats, however, the studies were carefully designed. 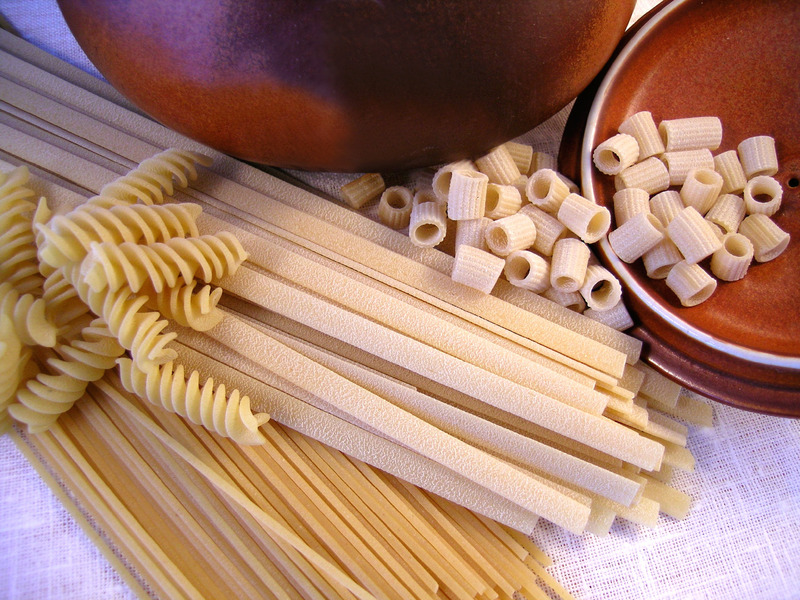 Both the KAMUT® wheat and the control wheat were ground at the same mill, and all grain products for the study were produced by the same artisan bakery and pasta maker. Subjects were given identical, controlled amounts of all grain products and instructed to eat no other grain products during the intervention and control periods; they did not know which grain they were consuming at any time. We often see wild, unsubstantiated claims about the pros and cons of modern wheat vs. ancient varieties, but these are some of the ﬁrst human clinical trials we’re aware of to explore this issue in a scientiﬁcally valid way. We hope to see even more, larger studies like this in the future. Alex -- Thanks for commenting. You've made a good point -- more variety in our diet is always a good thing and could have played a role. We always urge people to eat a variety of different whole grains, along with a variety of fruits, vegetables, legumes, and other healthy foods. I just bought kamut grain to grind and looking forward to better bread. Never tried it before. Thanks for the kind words. We just received a copy of the latest Kamut® study earlier this week, and hope to be reporting in the coming weeks with additional information to augment the first study you enjoyed so much. Stay tuned! What I in actual fact concern myself most about is health matters. On my own, I subscribe to journals oriented toward this subject, and I maintain educated about the most recent wellness lab analyses. Just how is this of any use? I feel there is no more significant focus for my energy. Likewise, this blog page seems as if it's well worth my time to read. I sift through 1000s or more of websites weekly. Truth be told, my back constantly is uncomfortable and I need a new spare time interest. lol Nevertheless, I believe if absolutely everyone published about their place in existence, and did it cogently, we'd have a more robust Earth. In the trial, do you know if they were using the whole grain or a 'white kamut flour' which removes the bran and maybe the germ of the grain leaving only the endosperm. I ask as my understanding is the germ and bran contain a high proportion of the nutrition. Many thanks for your website. As the fifth paragraph says, the Kamut was "semi-whole" -- some of the bran and germ remained, but not all of it. While in the U.S. we tend to have grains that are completely whole (all the bran, germ, and endosperm) or completely refined (just endosperm, no bran or germ), in Europe it's common to have different "extractions" that fall somewhere in the middle. This may be more than you wanted to know, but here's what the Italian researchers told us when we asked. I hope this helps! - Flour of Kamut and flour of an italian soft wheat (semi-whole) for production of biscuits, crackers, bread. - of the 6 layers surrounding the seed, there are portions of the first two inner layers. The outer four layers are not present in semi-whole wheat flour (they are present in the whole wheat flour only). According to Italian standards, per 100 Parts of dry substance, the flour type 2 (semi-whole) must have 0,95 of maximum ash, while the whole flour must have 1,40-1,60 of maximum ash. 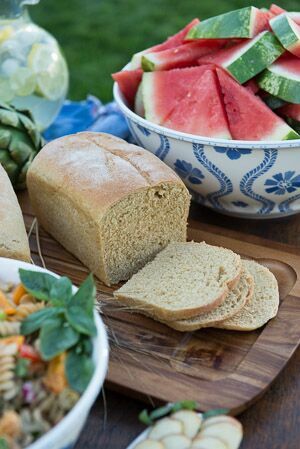 Hi, Does anyone have a no fail bread machine recipe using whole grain Kumut/Khorasan. Ive recently bought some Kamut grain :(20kg) to home mill instead of spelt. I have made a loaf to a basic Duram wheat recipe as well as a spelt recipe. one rose sightly more than the other but both were bricks in wieght and density. If anyone has some tips and tricks etc. Hi Bethany, That sounds delicious! Freshly-milled whole grains make the best tasting products, in our opinion! Thank you for your tips. The protein banding of khorasan wheat, Triticum turgidum, is likely significantly different form semolina, T. durum, or hard red wheat, T. aestivum. This may lead to many of the health benefits in using khorasan wheat, T. turgidum, in leu of T. aestivum or T. durum. As for the nutrient change, what is the difference in the content of potassium or magnesium in the grains themselves. Is it the content of these two minerals in the grains that accounts for the change in blood levels or is it something within the grains makeup that helps with retention of these minerals in the blood stream? I look forward to more study information both on the actual differences for the grains from each other as well as larger human studies on the rains themselves. In addition, a comparison with older tall grass varieties of T. aestivum will be of great interest. Hi Renee-- You have some great questions and we, like you, look forward to seeing more studies that help illuminate those answers. To answer your question about the potassium and magnesium levels in khorasan wheat compared with durum wheat, I took a look at the USDA's Nutrient Database (https://ndb.nal.usda.gov/ndb/search/list). According to the USDA data, khorasan wheat has 403mg potassium and 130mg magnesium per 100g. The entry for durum wheat says it has 431mg potassium and 144mg magnesium per 100g, so very similar (though slightly higher) values. So it is especially interesting that khorasan wheat appears to contribute to higher blood-levels of potassium and magnesium than durum wheat does. We look forward to learning more about the mechanisms behind these observations as more research is conducted and published. Hi Dr. Peter -- Thanks so much for writing. This area of research is very new and we applaud Kamut Enterprises of Europe for contributing funding to the independent research published in these studies. We hope that these findings will inspire other research groups, vested or not, to explore these differences further and we will keep our audience updated as this area of research develops! I applaud your research. I am finally retired but I spent 40 years working in academic research in various disciplines. Many of those years I worked in Food Science and Human Nutrition along with Gastroenterology (and I am well published). I am happy to see Kamut funded a study and put their product to the test. Pharmaceutical companies fund research on their products as well. That is how many drugs go from benchtop to bedside or further in clinical trials. It is extremely hard to get patients (subjects) to show up for blood work and there are many factors that influence health variabilities such as smoking vs non and current patient health issues such as allergies and inflammation (as we all have them). Then there is the ever present lipemic sample that plagues us all (sigh). Maybe the next phase could be DNA extraction for molecular testing. But to me all research is interesting and holds great hope for the future. Never give up! ...the hybridization of wheat, GMO wheat, and chemically treated wheat may be responsible many of the emerging intestinal problems that we see today. If we consider that as humans that we co-developed with our food sources we may begin to understand that our 'engineered' food is not recognized by our bodies. Our individual genetic variation make it quite difficult to draw black and white conclusions but the alarming number of gut diseases is relatively new and alarming. Of course, we cannot blame everything on wheat...but it does make up a large portion of our food supply. Hi Michael – Thanks for reading our blogpost. It’s a common misconception that modern wheat has been genetically-modified. In fact, there is no GMO wheat commercially available (https://www.ers.usda.gov/topics/crops/wheat/background.aspx#supply) in large part because U.S. farmers have fought hard against GMO wheat, out of concern that it would put a damper on the export market for US-grown wheat. For more information about this and other similar topics, you may be interested in reading our Myths Busted page (https://wholegrainscouncil.org/newsroom/myths-busted) where we sift through what’s true and false about the wheat in our food supply. Hi Greg – We’re so happy to hear that your family member found something that works for them. While none of the commercially-available wheat in the US has been genetically-modified (https://www.ers.usda.gov/topics/crops/wheat/background.aspx#supply), there are many different things that can make someone sensitive to wheat (as is true of other foods too). Glad you found a tasty solution that works for your family.